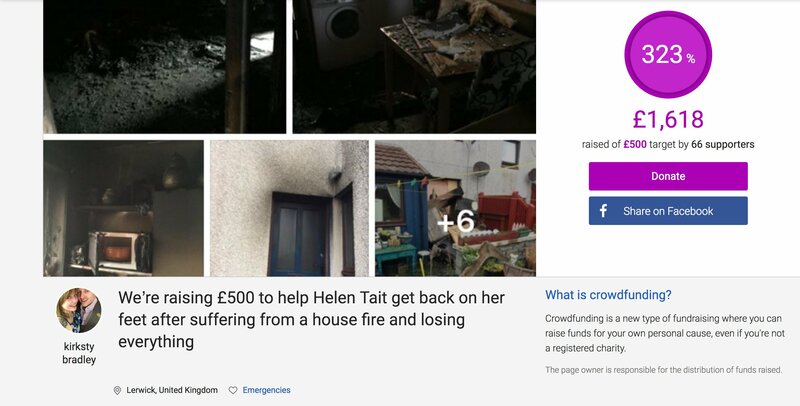 THE SHETLAND community is rallying around for a woman from Lerwick who “lost everything” in a house fire in the early hours of Saturday morning. Helen Tait was left devastated following the blaze at her Sandveien property, which thankfully left no one with any injuries. Her friend Kirksty Bradley quickly launched the Facebook page ‘Help Helen Oot After House Fire’ in an effort to source unwanted furniture and household items. Within a matter of minutes, items like tables, beds, curtains, kettles, toasters, TVs, cabinets and cutlery had been offered. The campaign is also actively looking for smaller items like toiletries, glasses, socks and slippers. Local business Home Furnishing said it would provide products to Helen for cost price to “help her get back on her feet”. A fundraising page with a £500 target was set up on Sunday, with any excess money raised set to go to Lerwick Fire Station. By Monday morning it had reached over £1,600. Bradley said she was “overwhelmed” by the offers of donations from the public. Helen is due to find out on Monday where she will be moved to until her house is made safe. Two fire appliances were sent to the scene at around 1.15am on Saturday and four breathing apparatuses and two hose reel jets were used, as well as thermal imaging cameras. Kirksty said Helen was “one of my closest, oldest friends, and no matter what we have both been through we have always been there for each other”. She described her friend as the sort of person who, if you asked to borrow her lawnmower, “next thing you know you can hear a lawnmower and Helen will be cutting your grass for you! It is in her nature to help people and her attitude is very much one of just get it done”. Kirksty said she was currently down in Wales and, when she heard the news, the first thing she did was transfer her money to buy something to wear. “But it was frustrating knowing that I couldn’t physically help her, which is why I made a page asking ‘friends’ to help. I never expected strangers to offer help of every variety. To get in touch about donating items, visit the Facebook page here.